Straightforward enough, huh? Well maybe not. I’ve been reading Experience, evidence and sense: the hidden cultural legacy of English by Anna Wierzbicka. In it, she argues that the word experience, particularly in the third sense of the noun described above, is a peculiarly Anglo-English concept that cannot be easily translated into other languages. Furthermore, this use of the word is a relatively recent development in the English language, not appearing until around the 18th century. Its rise coincides with the rise of empiricism in British philosophy (Hume, Locke), in contrast to the rationalism (Descartes, Leibniz) that continued to dominate philosophical thought in the rest of Europe. So I’m wondering what this means for the way we conceptualise and study Visitor Experiences in a global context. It’s a significant question, as numerous theories in tourism, education and other areas hinge on defining characterising the experience. Obviously, English speakers aren’t the only people to have ‘experiences’. But maybe we are the only linguistic group to conceptualise and describe them in the way that we do. So when we talk about experiences across cultures, how do we know we’re all talking about the same thing? Pine and Gilmore's 1999 work set up a value chain that had commodities at the bottom, then goods, then services, then experiences. So now I'm left wondering how Anglo-centric this highly influential idea is . . .
I’m probably late to the party on this – it’s likely others have already given this considerable thought. I’d appreciate links to additional resources on this point. Given ‘experience’ is a key word in my thesis title, it is probably worth my while mulling it over for a while. Pine, B. J. I., & Gilmore, J. H. (1999). 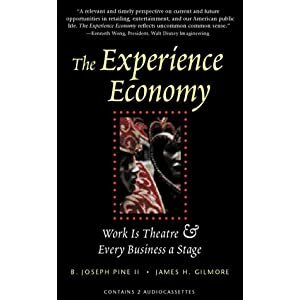 The experience economy: work is theatre & every business a stage. Boston: Harvard Business School Press. Wierzbicka, A. (2010). Experience, Evidence, and Sense: The Hidden Cultural Legacy of English. Oxford: Oxford University Press. Very interesting question! We should really think it over since quite a lot of us have our research questions related to or stemed from exprience economy. Acturally, the book has been translated into Chinese and got published in 2003 in China. The translated title of the book literally put emphasis on the sensory and knowledge-learning attributes of experience to my understanding. It’s much more close to the definition 1,2 as a noun. Also, you are quite right that the third sense of noun does not match well with the Chinese way to use the word of “experience”. There has been quite a lot research based on experience economy in China to look at the tourism destination planning and development in order to enhance the experiential outcomes. Yet there has been campratively less studies on subjective eliciation of experiential benefits in China. I hope the information will be helpful to you. Thanks that’s interesting to know. I started reading this just before our writing workshop which is why I was so interested in the translation of questionnaires and how you check for conceptual equivalence between languages.